Sidney and Harry Gross opened a small factory in Philadelphia in 1899, they produced ‘Monkey Brand Soap’. 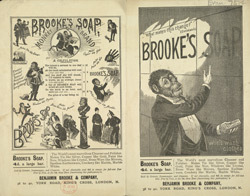 They moved their company to Port Sunlight and the name Benjamin Brooke was used to sell the soap. Illustration usually included a monkey, often wearing evening dress as he is in the illustration on this leaflet, and sometimes involved in household chores or everyday tasks.